Globally competitive, innovative manufacturing solutions for customers of all sizes. ﻿﻿﻿﻿﻿﻿Our design engineers are experienced in mold making and the injection molding process. Plastimold will save you time and money by optimizing your parts for manufacturing. All tools designed and built by Plastimold are backed by a lifetime mold guarantee. We build precision Aluminum and Steel tools to meet your production requirements. ﻿﻿Operating in a fully automated and climate controlled facility, we run ﻿24/7 to keep up with the most rigorous production schedules.﻿ We offer a turnkey manufacturing solution for businesses of all sizes. Plastimold Products is the one stop shop you've been looking for. We specialize in the design and manufacturing of custom injection molded parts at the lowest cost possible. As an ISO9001:2015 certified and registered company, our goal is to consistently provide quality parts, meet customer expectations, and adhere to regulatory requirements. All tools manufactured with Plastimold are guaranteed for life. Finished goods delivered assembled, printed, packaged, and labeled. 100% Fulfillment of your product. Adhesive bonding, mechanical assembly, hot staking, and ultrasonic welding. Custom package design and production. Bulk packed items are packaged with care so they arrive to you without any damage during transit. Test form, fit, and function using the latest FDM, SLS, SLA, Polyjet, and Metal 3D printing processes. Which Materials Should You Use to Develop Your Next Big Product for the Food Industry? Are you Mechanical Design Engineer planning for production? Copyright 2017 by Plastimold Products. Ask these 13 questions to determine the perfect manufacturing partner! 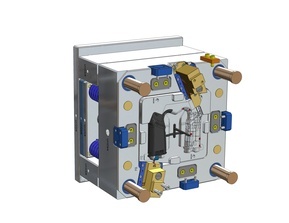 Learn how to design a part optimized for injection molding.